We have been having lots of fun since we came back to Nursery. We have been learning about the lifecycle of a butterfly and have watched carefully as our caterpillars have changed and grown into beautiful butterflies. We then released them safely into our Nursery garden and watched them fly away. We have also been finding out about Harvest and have had fun playing with the tractors and combine harvesters. We made apple crumble using the apples from the tree in the playground. It was yummy! Wow! So long since we posted. Here we are nearly at the end of the year. Transition for our preschool children is going beautifully and our little afternoon children are having a busy, productive time too! Please have a look at our Buddies slideshow. We still have one or two to catch and will pop them in as soon as we can catch the children together. Welcome back everyone! It’s been lovely to see all the children coming happily through the door, with big smiles and lots of news about Santa! We have welcomed 9 new children into our afternoon group, bringing our number there up to 23, and have really enjoyed meeting them and seeing them settle so quickly and happily. Please look out for nursery newsletter next week to keep you up to date with what’s going on in nursery. We can’t believe that the term has come to an end! It has zoomed in! Preparing for our wonderful Christmas Concert made the term extra busy but we had so much fun and were unbelievably proud of every one of our lovely children. Thank you so much boys and girls for working so hard to learn the songs and the story and for shining so brightly on the stage. We would like to thank all the Parents and Grandparents who helped us to make costumes and to get the children in and out of them on performance days and a big thank you too, to our very artistic face-painting team. What a wonderful team effort! Our Christmas parties rounded the term off perfectly, especially since Santa dropped in…must have been all the wonderful singing that tempted him in! Slideshow and photos of both parties will follow in the new term. Finally… we wish you all a very happy holiday and a very Merry Christmas. See you all on Tuesday 6th January. Welcome to a new term at Longniddry Nursery. We are joined by three new children in afternoon nursery, bringing the class number there up to 14. Thankyou to all parents who managed along to the parents consultations in the last week of term. It was lovely to see you all to share so positively in your child’s learning experiences. Thankyou also to all parents and grandparents who were able to accompany us on our walks to Gosford Woods this week. 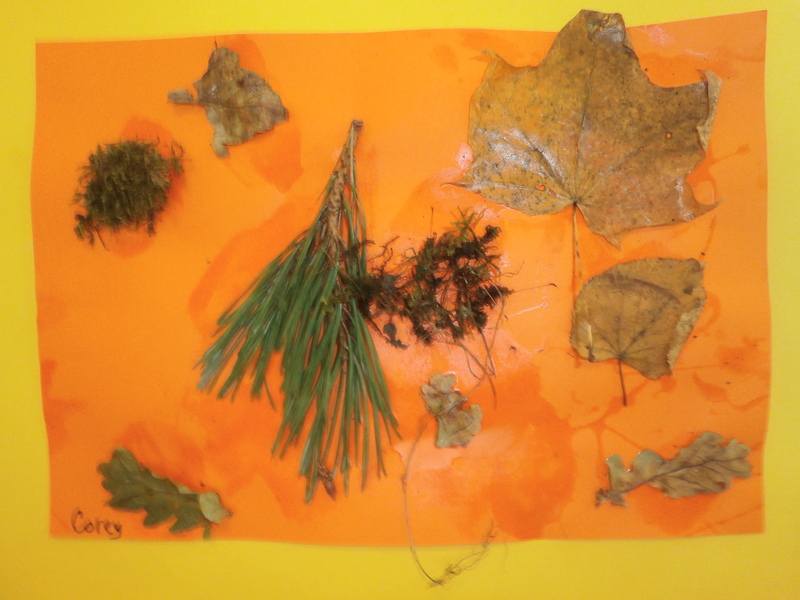 The children all had a lovely experience and our morning children have made some lovely autumn collages with the ‘autumn treasure’ they collected. Have a look at Corey’s lovely picture! Please also note that we have Halloween dress-up days on Thursday the 30th for our afternoon children and on Friday the 31st for our morning children. Welcome to the first nursery ‘post’ of this new academic year. Our staff team is now complete. As well as Ms Linton, Mrs Reynolds, Mrs Banks, Mrs Hunter and Miss Bowers, we are joined by Mrs Dalrymple on Monday to Thursday, by Miss Blake every Friday and by Miss Henry on alternate Fridays. Hurray! We’ve had a great start to the year and the children have been busy, busy, busy learning about Farm Machines, The Food that we Grow, Autumn… and now they’re keen to learn all about Fish. We’ve enjoyed lovely visits to the library and are currently planning our Autumn walks to Gosford Woods. Please look out for the parent helpers list for this, once our dates are confirmed by Mr Andrews from the Gosford Estate office, as we need lots of extra hands to keep our little people safe. And talking of ‘staying safe’, our little afternoon children have been doing some really challenging work on balance, in the gym and outside. Have a wee look at the slideshow below to see some of them enjoying the chance to climb, balance and jump from a height onto the crash mat! Great work boys and girls! Looking forward to meeting you all at the parent consultations next week. Please remember to make an appointment if you haven’t managed to find a suitable on already. We’re well into the final term of this session and both morning and afternoon nursery are having great fun, however it’s a particularly busy and poignant time for our morning class. This week they began their transition activities in earnest by changing into their gym kits all by themselves for the very first time and on Wednesday they met their ‘buddies’ for the first time too. Both classes had a lovely time, playing together in the nursery and are looking forward to enjoying long and lasting friendships. Click on the slideshow below to see them together in nursery. It’s been busy, busy, busy in the nursery again! Our morning nursery have had great fun learning about icebergs and how water changes form.You can see how much they enjoyed it in the slideshow below! We’ve learned lots about Fairtrade over the past two weeks and our wonderful fruit basket won a prize in the Fairtrade Art Competition… thankyou Mrs Banks and children for all your hard work on that. It’s beautiful! Please remember it’s ‘Sport your Trainers’ day on Monday and Mums and Dads, please look out for the Parent Consultation sheets on your notice board and sign up for an appointment that suits you. It’s November and we’re all happy and having lots of fun! We’ve been busy, busy, busy! A visit from Pudsey … library visits … and our community police constables came to visit too, with their police van! Thanks to Pudsey, Pirate Ann at the library and Dougie and Fiona, our police constables for helping us to have such fun at nursery. The nursery ladies will be wearing their jammies next week on Thursday and Friday to join in the Children in Need fun. Please could morning nursery children wear jammies on Thursday 14th and afternoon nursery children do the same on Friday the 15th? Teddies are very welcome to come and join the fun too and if you have a wee spare penny or two to put into our Pudsey box, that would be lovely. We are also selling Pudsey wrist bands for £1.00 in the nursery. We have managed at last to secure a booking at The Brunton Theatre to see the pantomime ‘Sleeping Beauty’ on Wednesday the 4th of December. The panto trip is open to both nursery groups, so please look out for a letter next week. Please remember to be free on Friday the 13th of December to come and enjoy the Nursery Christmas Concert. We’ve started learning some lovely songs and it’s going really well! Finally, thankyou very much to all Mummies, Daddies, Grandparents and child minders who joined us for our learning story open sessions last week. The children loved having you here and so did we! If you haven’t managed in yet, just have a word and we’ll arrange a time! We can’t believe we are 6 weeks into the term already! The children have all settled in beautifully and we’re all very happy. Please make sure you have signed up for a parent consultation on either Wednesday the 9th or Thursday the 10th of October. The sheet is displayed on your notice board in the cloakroom. if you can’t find a suitable appointment, just have a word and we’ll sort something out. Please note also that our walks to Gosford Woods have been confirmed for Tuesday the 8th of October for our morning children and Thursday the 10th of October for our little ones in afternoon nursery. The theme for our walks is autumn. To get ready for this, why not have fun with your children spotting the different colours on the trees or kicking through the crunchy leaves? Just chatting to them about the signs of autumn all around us will help them to develop an awareness of the changing seasons. If you find anything interesting, like conkers or pretty leaves, the children are welcome to bring these in to add to our autumn display table. Please sign up to come and help us on our autumn walks on the sheet displayed on your noticeboard in the cloakroom. Unfortunately, we can’t welcome little brothers or sisters, if you wish to come with us…we’ll need all hands free to keep the nursery children safe and happy. Enjoy our slideshows of the nursery children having fun in this first term of 2013-14. The School Bookshop will be open for nursery children tomorrow at 9.00 and 1.00. Children must be accompanied by an adult to help them to choose. There are some wonderful bargains to be had. Remember you don’t need to have been saving to buy a book. Everyone is welcome! More Parent Helpers needed please! Thankyou very much to those parents who have offered to help out on our trip to the beach on Tuesday the 11th of June. So that the children can actually get into the rockpools, we desperately need 5 more helpers to meet the ratio of 1:2 required to keep everyone safe. Please let Ms. Linton Know as soon as possible if you can help. On Wednesday the 22nd and Thursday the 23rd of May, Longniddry nursery classes visited Gosford Woods for a lovely walk and a look at how The Woods have changed since our last walk, way back in the autumn. Both classes loved being in among the new green leaves and having a good ‘rummage’ in the forest floor for minibeasts! The Morning nursery group got all the way to the wild boar enclosure…but as usual, the boar heard us coming and beat a hasty retreat! Thankyou very much to all our lovely parent helpers…without you these exciting ventures out and about just couldn’t happen! Enjoy our latest slideshow! Here are the afternoon nursery enjoying Smoothie Day every bit as much as our morning children. Watch out for more Smoothie moustaches! Thankyou very much to Lindsay and Claire in afternoon nursery and Caroline in morning nursery for helping the children to make their yummy smoothies. At last! A new slide show..Posted by Ms Linton. Can you believe it? Here are the morning nursery class enjoying Smoothie Day. Look at all the fun the boys and girls of the morning Nursery class had at their Burns Supper last week. They enjoyed haggis, neeps and tatties then dancing in the hall.